I'm sorry I wasn't able to give the quiz answers as soon as I expected, but a large number of orders for the stamps which surfaced in our absence kept me busy, and then we had some pre-Christmas family visits to do. So, before we get back to work, this being Sunday, a recap on our absence. Our holiday was more than that, it was a celebration of 40 years of married life, and a chance to recharge the batteries. The planning started this time last year, when we decided on 4 or 5 weeks in New Zealand, which eventually stretched to six weeks. Since our 20s neither of us has ventured outside Europe, but decided that the direct flights to NZ were too long, so we would need some stopovers. We don't like extreme heat so, deciding that Singapore, Kuala Lumpur or Bangkok would probably be too warm, we opted for Tokyo. We left Heathrow on August 29th (bank holiday Monday in the UK), flew overnight (and over Norwich! ), and spent three nights in Tokyo. As identified by several readers, picture 5 does indeed show Tokyo - the Sky Tower on the left, and the Asahi Beer HQ across the river from the Asakusa landing for the Tokyo River Cruises. As you can see it was clear blue skies and our plans went awry at the first hurdle as the temperature climbed to 33C or more! We weren't brave enough to try the trains or buses on this short visit and took the boat from Takeshiba to Asakusa where we guided ourselves to the Senso-Ji temple. 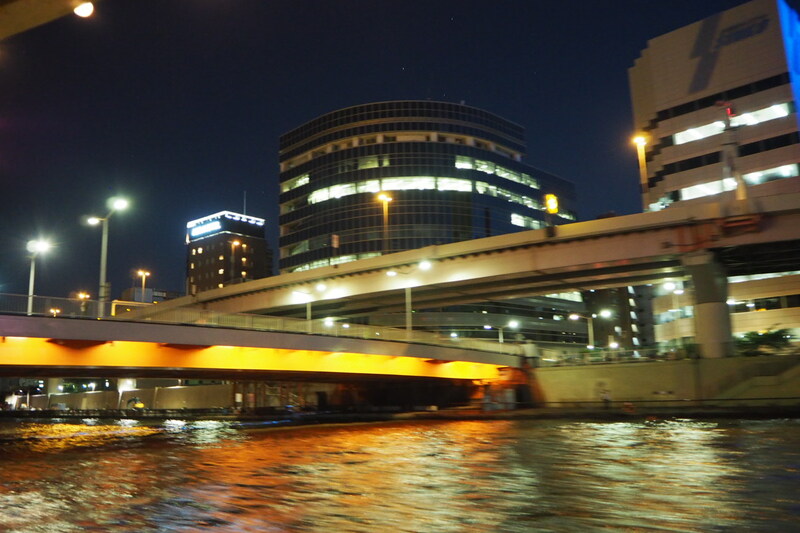 Due to high tides we could not return on the boat we had planned to, and so our return journey was through Tokyo at night. We thoroughly enjoyed our brief stay in Japan and we hope to return to see more of the country. The next long flight was to Auckland. Neither of us slept well on the aircraft so we were pleased not to have hired a car from the airport to start our tour immediately. We used Top 10 Holiday Parks and pre-booked out first stop at Kauri Coast (Kaihu). After a couple of nights there we headed to Russell on the Bay of Islands. Picture 9 is taken from Flagstaff Hill on the Russell side of the bay, and shows the Waitangi Treaty Grounds, as correctly identified by a few readers. At Russell I reset the options on the GPS: from Kawakawa we should have gone to Opua and across the ferry to Okiato, but the device led us on an interesting journey via Waikare Road and Russell-Whakapara Road. Those who know the area will appreciate that this was our first experience of New Zealand's unsealed roads - what fun! For our next stop we headed beyond Auckland. We were aiming for Coromandel but most of the sites were booked up for Friday night so we ended up in the backwater of Orere Point. Then we headed down the coast of the Firth of Thames, past Tauranga to Rotorua from where we visited some of the thermal lake areas, and the Buried Village. We took a stroll around the town, and I found a collectable shop with some postal history and couldn't deny myself the opportunity! One walk took us to the former bath house which is now the Rotorua Museum, as shown in picture 4. After a few days we headed on to Gisborne, via Whatakane and Matawai using the Waioeka Gorge. Good job we didn't have to ask how to pronounce some of these names - four vowels in a row! At Gisborne we were close to the beach and quickly went for a walk before the evening light faded. In a nearby park was the statue of Captain James Cook shown in picture 13, again correctly identified by some readers. Our next stop after Gisborne was a few days at Hastings on Hawke's Bay, which included visits to Napier and Havelock North. Picture 14 is on the second storey of the Art Deco Centre - and also on one of Universal Mail's stamps, sold only at the Napier I-Site (information centre). Highlight, though, was the Gannet Colony at Cape Kidnappers - but I could bore you with hundreds of pictures of birds, so I'll post them on flickr later. Meanwhile here's a link to one on Photobucket. While planning our route through North Island there was always a problem in deciding where to go and where to leave out. It would have been good to go to Taranaki, but that is right over on the west, and we hadn't even done the whole of the East Cape area. With an Interisland crossing booked for 27 September we went west to Whanganui before heading down to Wellington. Picture number 1 is indeed at Whanganui, this stainless steel globe sculpture by David McCracken on the riverside is here viewed with a long lens from the top of the Elevator at Durie Hill. And picture 2 is the Wellington Cable Car tunnel, which took us from the huge Botanical Gardens to the downtown area - and Wellington is so much more appealing than Auckland. And so to South Island! Of course the first stop was Picton as that is the Interislander ferry terminal. And picture number 15 (below left) is one of the more difficult ones in the quiz. Pita Rua carved the whale into a tree using his chainsaw. St Joseph's Church is in the background. While at Picton we had a short excursion to Havelock (yes, the original one), along Queen Charlotte Drive. As the sea forecast was poor we headed west to Greymouth instead of taking a whale-spotting tour from Kaikoura, a place many of you will have heard about recently. The Greymouth site was right next to the beach - and the airfield (where no permission is required to land), and the railway. The west coast highway was far easier than I had expected, and we headed south through Hokitika to Franz Josef and a trek to the glacier, or as close to it as we could get. Seeing an ice cave alongside the track did make us wonder how much of the 'rock' we were walking on and round was actually ice. But the weather was better on the day we left, and we took the opportunity to drive to the Fox Glacier viewpoint and this provides picture number 17, another long-lens shot (above right). Another pre-booked stop was at Te Anau for the Milford Sound excursion so we headed down to the Haast Pass, and on to Wanaka, by-passing Queenstown which is said to be almost as expensive as Auckland! Picture 18 is indeed the village of Milford Sound from the boat. We were blessed with excellent weather at Wanaka, Te Anau and Milford (named after Milford Haven). Another off-road highlight was from Wanaka to the start of the Rob Roy track - a mostly unsealed road, with 9 fords! From Te Anau we headed to Dunedin, including driving the Presidential Highway. What?, you say, New Zealand doesn't have a president! No, but it does have a 44km road which runs between the towns of Clinton and Gore! After Dunedin we headed to Christchurch for our flight to Auckland, and then out of New Zealand. Pictures 16 and 6 were correctly identified as Dunedin Railway Station and the Re:Start Mall in Christchurch, the latter made from containers while the city is rebuilt after the 2011 earthquake which toppled the cathedral spire and resulted in most of the central city blocks bearing the red and white logo of Wilson's car-parks. The devastation which is still evident was very sobering. Our air ticket was designed as 'round-the-world' requiring us to continue in an easterly direction. Val had wanted to visit San Francisco while I had a liking for New Orleans, so we flew from Auckland to San Francisco, staying for a few days and seeing the Japanese Garden in Golden Gate Park (picture number 3). Although we were losing hours with every eastward trip, we gained an extra October 15th, checking into our SF hotel at an earlier local clock time than our flight from Christchurch, on the same day. Rather than drive to New Orleans - or fly direct - we decided to take the train, specifically the Sunset Limited from Los Angeles which left LA at around 10pm on the Wednesday and scheduled to arrive in NO just before 10pm on Friday. Of course we missed southern California (it being dark), and a further stretch, but there was plenty to see during daylight hours including El Paso Amtrak Station - picture 7. This is much more impressive than, for example, the station at Houston Texas which is more like a couple of portacabins. We had a great time in and around New Orleans including the Steamboat trip and a visit to the alligator swamps, and of course, street jazz, bar jazz, and excellent food. Cutting a long journey short for the purposes of this narrative, picture number 11 is indeed Jackson Square with St Louis Cathedral in the background as identified by a number of readers. New Orleans is another place added to the 'must go back' list, but maybe not San Francisco. As we had relatives in Halifax NS we paid them a visit coinciding with Halloween, needing two flights, via Newark NJ. While in (largely sunny) Nova Scotia we visited Lunenburg, the colourful subject of picture number 10. We hired another car to drive down to Boston as our ticket package didn't allow a return flight from Halifax (only JFK, Washington or Boston - or Vancouver). On the way through New Brunswick we had to visit a third Havelock just to get off the fairly tedious highway - nothing to see but trees, not even much traffic. In New England we passed through the deprived areas of rural Maine, and through and around the White Mountains of New Hampshire, and the famous Bretton Woods Mount Washington hotel. - picture number 12. We couldn't see Mount Washington - New Hampshire was largely cloudy and wet. But Boston - where we had an afternoon and much of the next day to wander - was sunny and bright, and we enjoyed our last day. On the opposite side of the bay to the city is Boston Logan Airport with - as one person identified - the Hyatt Hotel on the left with the control tower behind (picture 8). We landed at Heathrow at 9am on November 6th, breezed through the formalities and met our taxi driver by 9.30. He had us back in Dereham in not much more than a couple of hours, and it was all over! Thanks to everybody who took an interest. I'll check out the replies and contact the prize winners before the end of the week. OK, so that promise didn't work, and it won't happen before Christmas now. But when things have settled down, I'll get back to you.